While wild animals across the country had been struggling to keep their bellies full over the long, cold winter months, one particularly pudgy rodent was packing on the pounds without breaking a sweat. Meet Sammy - the happiest squirrel in America. "He knows he's got it good," retiree Ed Maclean told The Dodo. Sammy's been living in his tree for years now. "I mean, just look at him." Some folks might go to great lengths to keep squirrels away, but Maclean and his wife in West Wareham, Mass. do quite the opposite. 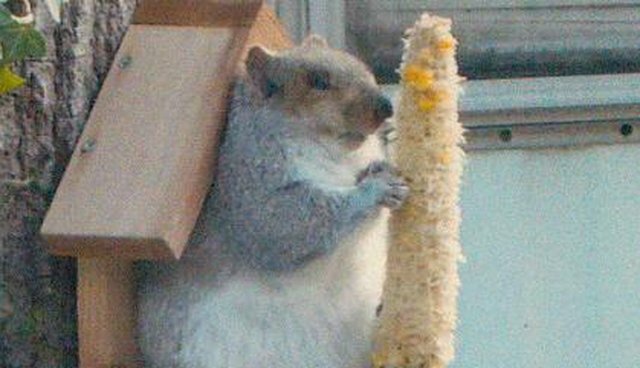 Several times a week, they prepare little feasts specifically for their furry, backyard neighbor - corn on the cob, to be exact. 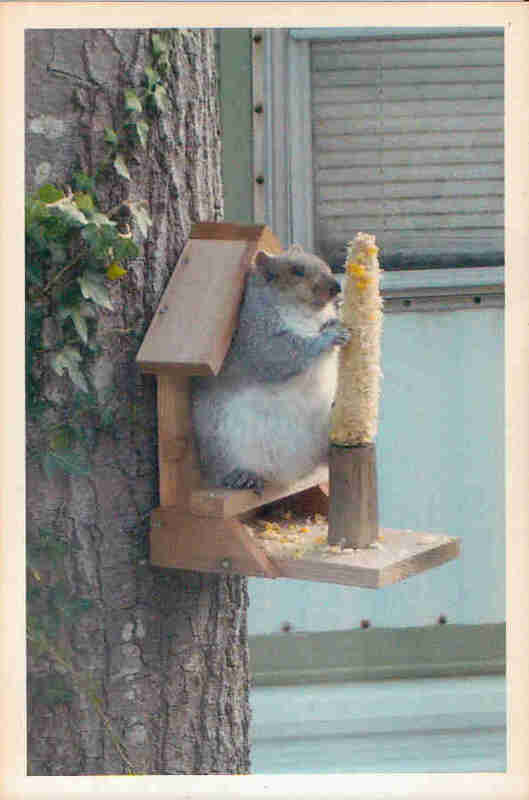 A few years ago, "I put this little corn holder in the tree and a few days later this little squirrel came down and he ate the corn off the cob. We named him Sammy," says Maclean. "He was small then though, but he's a lot larger now. He's got a fat belly now." "He's got total reign of the corn," says Maclean. "When one corn is gone, we put another one up there. He eats whenever he wants to. He's quite the squirrel." Despite Sammy's visibly portly frame, all those tasty cobs haven't slowed him down. By all accounts, says Maclean, he's still a perfectly active squirrel. "Sammy is always running, up and down the tree, around the yard," he says. "We watch him jumping from tree to tree." The happy rodent's bulging waistline aside, "Generally, there's nothing wrong with feeding squirrels, but we typically tell people that once you start, more will keep coming. Soon you could be feeding them all," Jack Banagis, from the New England Wildlife Center, told The Dodo. "We would normally recommend small portions, but I think it's okay." Sammy would no doubt agree, appearing to be perfectly content with his rounder new figure. In fact, after seeing Sammy's photo, the center's executive director Dr. Greg Mertz wondered if the added weight might make evading predators a bit more difficult, but concurred that he really was "probably the happiest and fattest" squirrel in America - a distinction that plump Sammy looks to be all ears to hear.